Make it the best father’s day ever with cool gadgets and legit socks dad will actually wear! Hooking you up with some of my top ideas as shared on The DA Show on CBS Sports Radio. FORE! This Bluetooth speaker is designed to travel with you right inside your golf bag alongside your clubs. The attached tee spike will slip the speaker right into the tee holder on the dash of dad’s cart, or he can use the ground spike to take tunes directly to the tee box! Weather resistant, a massive 10 hours of battery life, and it’s a bonus charging block with two bonus USB ports to plug in your devices. Note—the shaft is removable for storage. If you’re pops is a fan of cold brew, this all-in-one unit has his name all over it. This gadget creates the perfect cold brew in 12-24 hours, using your favorite ground coffee, no batteries or wall outlets required! The coffee steeps in the top, then when you’re ready, just hold the button down to drain your brew into the insulated, detachable carafe. Dad will be excited to show his team spirit by proudly displaying the Hover Helmet! 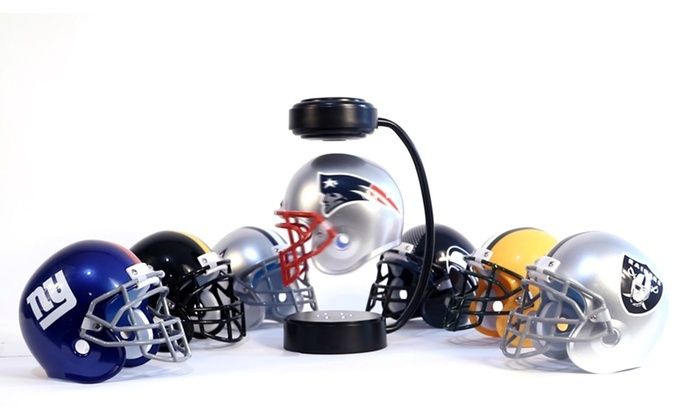 A half-sized version of your NCAA or NFL team’s officially licensed helmet floats magically and rotates indefinitely once plugged in. Dad will surely get a laugh out of these sarcastic socks, that he’ll ACTUALLY want to wear! Pick from designs that declare; “Do I look like a team player?”, “Worst gift ever!”, “Adult in training.”, and lots more. The entire family will be excited to find T-Rex roaming through the backyard this summer! This inflatable T-Rex sprinkler will have kids running around with one of the most terrifying predators to ever walk the earth, and at a gigantic 7 feet tall, its big enough for mom and dad to get in on the fun! Science constantly reminds us how critical a good night's sleep is – and yet millions of Americans continue to struggle at getting enough ZZs. Sleep Shepherd Blue helps you to fall asleep using soothing binaural tones. Then once you are asleep it helps to track and analyze your sleep in real-time with brainwave sensors and biometric feedback. You can use this data to retrain your body to get the most optimal night's sleep. *I work and partner with Sleep Sheperd. Win “Favorite Child” this Father’s Day with this gift for dad! The Grooming Barrel has everything he needs to keep his look fresh; 6 manly soaps, hair wash, shaving cream, face wash, solid cologne, hand balm, and after shave balm… and its all packaged in a cool wooden barrel!